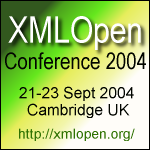 The excellent Sean McGrath is giving the closing keynote at XMLOpen in Cambridge this September. In my own bid for glory, i’m giving one of the first sessions on the Wednesday morning – Versioning XML and Open Source Tools. Should be fun! A Whatfettle article by Paul Downey published Monday, July 26th, 2004, at 3:37 pm under a Creative Commons License.